Modern services all around the Internet offer different two-factor authentication solutions. They provide stronger security than using only username and password. Two-factor authentication requires a combination of something the user knows and something the user possesses. One common combination is the username and PIN or password with a physical token, such as a specific device, smart card, or mobile phone. The two-factor secured service may range from a web service to a network device to a remote VPN (Virtual Private Network) access – wherever stronger security is needed. Radiator AAA Server Software provides flexible, interoperable, and scalable two-factor AAA (Authentication, Accounting, and Authorisation) service for any device or service, which can use RADIUS, TACACS, or TACACS+ interface for AAA. The VPN devices can authenticate remote employees, the network devices can authorise administrators, and the web services can identify the users with secure two-factor authentication. All you need is Radiator-based two-factor AAA service and a free mobile phone app, such as Google Authenticator, Microsoft Authenticator, or some other OTP/TOTP/HOTP app. The authenticator app is paired with Radiator two-factor AAA service and particular user credentials, and two-factor authentication are ready to be used. Another major benefit of using Radiator is its legendary interoperability. Radiator can combine complementary AAA information and functions from Active Directory, LDAP, and even 3rd party two-factor services, such as RSA SecurID, YubiKey, Duo Security, and Vasco Digipass. 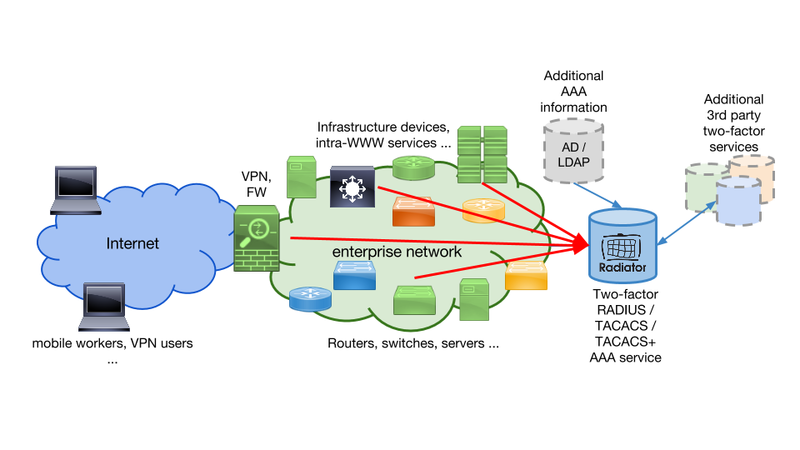 It can check existence and validity of a user from Active Directory, retrieve a proper VPN group, perform two-factor authentication using TOTP (Time-based One-time Password Algorithm), and then combine the results to a RADIUS authentication and authorisation response, which is sent back to a Cisco ASA VPN device. Radiator can also extend the functionalities of 3rd party two-factor authentication services by translating and complementing AAA interactions between services and devices. For example, Radiator combines fine-grained TACACS(+)- or RADIUS-based network device configuration authorisation with existing user directories and two-factor authentication. The two-factor authentication data may be retrieved from Radiator itself or some 3rd party service. With the help of Radiator’s extendable two-factor modules, Radiator also supports SMS transfer of one-time-passwords, when using tokens or authenticator app is not feasible. Fortune 250 company uses Radiator for two-factor authentication of their global VPN network. IT departments of world’s two top universities provide VPN service for their employees, partners, and students utilising Radiator’s capability to combine Duo Security two-factor authentication service to additional LDAP directory checks. Nordic operator provides multi-function (RSA SecurID, SMS) two-factor authentication service to their enterprise customers. Contact our team at info@open.com.au to set up a meeting, where we can discuss how Radiator could help you in securing access to your services or network with two-factor authentication.